Oracle Business Intelligence Applications (OBIA) are complete, prebuilt BI solutions that deliver intuitive, role-based intelligence for everyone in an organization from front line employees to senior management that enable better decisions, actions, and business processes. Designed for heterogeneous environments, these solutions enable organizations to gain insight from a range of data sources and applications including Siebel, Oracle E-Business Suite, PeopleSoft, and third party systems such as SAP. Oracle BI Applications are built on the Oracle BI Suite Enterprise Edition, a comprehensive, innovative, and leading BI platform. This enables organizations to realize the value of a packaged BI Application, such as rapid deployment, lower TCO, and built-in best practices, while also being able to very easily extend those solutions to meet their specific needs, or build completely custom BI applications, all on one common BI architecture. Oracle BI Applications is a prebuilt business intelligence solution. Oracle BI Applications supports Oracle sources, such as Oracle E-Business Suite Applications, Oracle's Siebel Applications, Oracle's PeopleSoft Applications, Oracle's JD Edwards Applications, and non-Oracle sources, such as SAP Applications. If you already own one of the above applications, you can purchase Oracle Business Intelligence Enterprise Edition and Oracle BI Applications to work with the application. Oracle BI Applications and Informatica PowerCenter can be deployed flexibly across a wide range of topologies on different platforms and combinations of platforms. Machine A is a machine that has installed Oracle Business Intelligence Enterprise Edition, on which you run the Oracle BI Applications installer to install the Oracle BI Applications files. 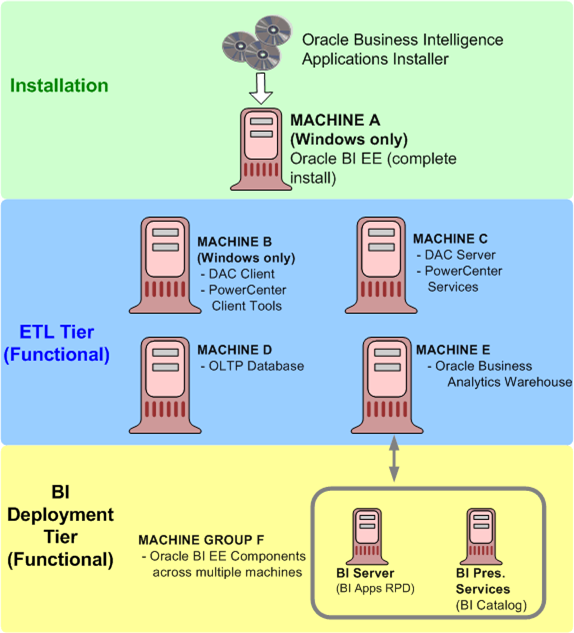 After the Oracle BI Applications files have been installed on Machine A, the DAC Client is installed on Machine B, and the DAC Server is installed on Machine C.
- The OracleBI\Server\Repository\OracleBIAnalyticsApps.rpd file is copied from Machine A to the machine that runs the BI Server in Machine Group F.
- The OracleBIData\Web\Catalog\EnterpriseBusinessAnalytics\*. * files are copied from Machine A to the machine that runs the BI Presentation Services Catalog in Machine Group F.
Runs the DAC Client and Informatica PowerCenter Client Tools. Runs the DAC Server and Informatica PowerCenter Services. Hosts the transactional (OLTP) database. The BI Deployment tier is used to deploy the business intelligence dashboards. High-level analytical queries, like those commonly used in Oracle Business Intelligence, scan and analyze large volumes of data using complex formulas. This process can take a long time when querying a transactional database, which impacts overall system performance. For this reason, the Oracle Business Analytics Warehouse was constructed using dimensional modeling techniques to allow for fast access to information required for decision making. The Oracle Business Analytics Warehouse derives its data from operational applications and uses Informatica PowerCenter to extract, transform, and load data from various supported transactional database systems (OLTP) into the Oracle Business Analytics Warehouse. • The Client tier contains the Informatica PowerCenter client tools and the Oracle BI Data Warehouse Administration Console (DAC). DAC is a command and control interface for the data warehouse to allow for set up, configuration, administration, and monitoring of data warehouse processes. o DAC Server. Executes the instructions from the DAC Client. The DAC Server manages data warehouse processes, including scheduling, loading of the ETL, and configuring the subject areas to be loaded. It dynamically adjusts its actions based on information in the DAC Repository. Depending on your business needs, you might incrementally refresh the Oracle Business Analytics Warehouse once a day, once a week, once a month, or on another similar schedule. o DAC Repository. Stores the metadata (semantics of the Oracle Business Analytics Warehouse) that represents the data warehouse processes.  Integration Services - The Integration Service reads workflow information from the repository. The Integration Service connects to the repository through the Repository Service to fetch metadata from the repository.  Repository Services - The Repository Service manages connections to the PowerCenter Repository from client applications. The Repository Service is a separate, multi-threaded process that retrieves, inserts, and updates metadata in the repository database tables. o Informatica Repository. Stores the metadata related to Informatica workflows. • The Database tier contains the OLTP and OLAP databases. The Oracle Business Analytics Warehouse is a unified data repository for all customer-centric data, which supports the analytical requirements of the supported source systems. • A complete relational enterprise data warehouse data model with numerous prebuilt star schemas encompassing many conformed dimensions and several hundred fact tables. • A set of ETL (extract-transform-load) processes that takes data from a wide range of source systems and creates the Oracle Business Analytics Warehouse tables. The PowerCenter Services can be installed on UNIX or on Windows. The PowerCenter Client Tools must be installed on Windows. You must co-locate the DAC Client with the Informatica PowerCenter Client Tools. ■ You must co-locate the DAC Server with Informatica PowerCenter Services. The DAC installer installs the DAC Client and DAC Server on Windows. DAC Client only runs on Windows. DAC Servers runs on Windows, UNIX, and Linux. The DAC Client can only be installed and run on Windows. ■ You must install Informatica PowerCenter Services before you install DAC. ■ The correct version of the JDK is installed by the DAC installer. ■ The DAC installer installs DAC in the DAC_HOME\bifoundation\dac directory. and target tables information up to date. variables on the DAC Client machine. in the environment variables on the DAC Client machine. ■ pmrep is used to communicate with PowerCenter Repository Services. Repository or often referred to as .rpd. The repository has three layer as shown below, the physical layer, logical layer and the presentation layer. • A prebuilt Informatica repository which includes mappings (wrapped in workflows) to extract data from the supported source systems (various versions of standard applications such as Siebel CRM - yes it was first - , Oracle eBusiness Suite, Peoplesoft, JDEdwards and SAP (BI Apps version 7.8.4) ) and load the data into the Oracle Business Analysis Warehouse. (Note: Oracle BI Applications version 7.9.5.2 includes a repository for the Oracle Data Integrator instead of Informatica but supports only Oracle Financials). • The Oracle Business Analysis Warehouse (OBAW), a prebuilt schema (stars that is) which serves as a turnkey data warehouse including dozens of stars and accompanying indexes, aggregates, time dimensions and slowly changing dimension handling (and yes, it can be optimized). • A prebuilt repository for the Data Warehouse Administration Console (DAC) server which is the orchestration engine behind the ETL process. The DAC client and server were included until version 7.9.5. Since then it is a separate installer. • A prebuilt Oracle BI Server repository (rpd file) which maps the OBAW physical tables to a generic business model and includes more than 100 presentation catalogs (aka subject areas) to allow queries and segmentation using Oracle BI clients such as Answers, Dashboards and Segment Designer. Did I mention that it also takes care of authentication and data security? • A prebuilt presentation catalog (repository) containing hundreds of requests and ready-to-use dashboards which enable tight integration between the source applications and the BI infrastructure (example: Click the Service Analytics screen in Siebel CRM, work with the dashboard data, drill down to details and click an action button to navigate back to the Siebel CRM record). Oracle BI EE 10g is the successor of Siebel Analytics and Oracle BI Applications is the successor of Siebel Analytics Applications. First, the DAC scheduler kicks off jobs to loadrefresh the OBAW at regular intervals or alternatively, these jobs could be kicked off manually from the DAC client. The DAC server uses the object and configuration data stored in the DAC repository to issue commands to the informatica Server. 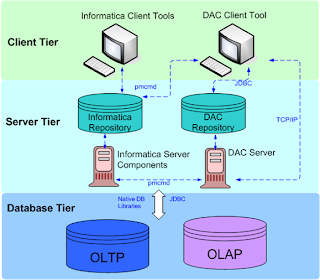 The informatica server executes the commands issued from DAC, and uses the objects and configuration data stored in the informatica repository. Then the data are extracted, transferred and loaded from the transactional databases into the OBAW target tables. After the ETL is complete and OBAW is online, an OBIEE end user runs a dashboard or report in the Answers or Interactive dashboard. The request comes through the web server and interacts with the presentation server. The presentation server interacts with OBI Server and OBI server will understand the requests and hits the OBAW if it’s not cashed and extracts the data and provides it to the presentation server. ETL mappings are split into two main mappings, SDE mappings and SIL mappings. Anyway, I have to admit that he looks gorgeous in izombie, even if it's hard to recognize our adorable blond Arthur.